At the beginning of the year, you will have received a copy of the 2013-2014 Guide to the School Year among the items brought home with your child. This guide provides important information about the York Region District School Board its schools. 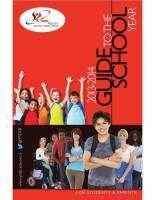 If you’d like to refer back to guide at any time, it is available online here.